Hi meet us, Lissa and Roberto, we are a dynamic husband and wife team. We offer quality, specialized permanent makeup, including microblading, microshading and 3D eyebrows, eyeliner, lip liner, beauty marks, freckles, tattoo removal, scar camouflage and scalp micropigmentation. One of the hottest and best services we offer is Microblading. Microblading provides the look of natural and beautifully shaped eyebrows that mimic hair. We are able to do this by implanting fine hairlike strokes or shades of color in a precise artistic manner & the shape is designed by the combination of your requests and our professional recommendation. Another great service we offer is Scalp Micropigmentation which give balding/receding men and women their hairline back and give those who are thinning, the appearance of fuller thicker hair as well as scar camouflage on the scalp or small areas on the body for anyone in or around the Cleveland/Northeast Ohio Area. We are trained, certified professionals that take pride in a great job done, we treat everyone fairly, honestly and with care. We listen to your requests and add them with our professional opinions to ensure the best outcome for your service. We truly care about people and love this career because it allows us to truly help individuals from young to old, from healthy to people dealing with chronic health issues. We are here to UPGRADE your status and give you back your beauty, strength, empowerment and time! Lissa Pena has been a cosmetologist for over 20 years, and is also a licensed medical laboratory technician. 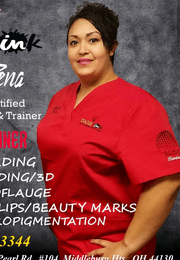 She studied and became certified in permanent makeup, apprenticed and worked full time as a sole proprietor in this field for over 4 years before teaming up with Roberto to officially become Status Ink & Scalp Status. She has always tried to learn more and do more to offer her clients and fell in love with the idea of permanent makeup. Now almost 6 years ago, shortly after she began to study and train in this field, she did a solo presentation for a breast cancer support group. From there she was lucky enough to help 3 individual ladies with restoring there brows, since thru their chemo treatments, hair regrowth was minimal or non-existant. The amount of gratitude and joy was of nothing she had ever felt before and she knew she was destined to keep following this career path. "The amount of happiness that filled my heart after helping these ladies, changed my life forever!" Shortly after, she realized continuing education is the best thing to do to keep up with the ever changing beauty industry. She was working very long hours with a full and part time job. She gave up her corporate positions as a nail tech and an MLT lab orderer, to pursue the world of Permanent Makeup full time. Soon after became certified as a Professional Scalp Micropigmentation artist and Tattoo Removal Technician. "This career, helps so many people and lets me truly make an impact on this world!" Roberto Pena, an engineer and quality control expert by trade, supported and continued working his career as normal during the beginning years as Lissa established the business so that the family and finances were secured. All while sharing the experiences, stories, meeting many of the clients first hand. He quickly knew he also wanted to pursue this career avenue but needed to wait until the very perfect moment to do so to transition the household from a regular corporate worker home to being a completely sufficient two-person operating business household. So over 3 years ago Roberto begun learning and training and managing the business as well. He became certified and apprenticed with his wife, for a year part-time before exiting his position in the corporate world. 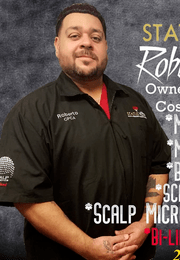 October 2016 when they opened up as Status Ink & Scalp Status officially, they knew they had to set the ball in motion and that in 2017 the transition would be complete for Roberto. There are not very many men that are in the permanent makeup career so he had a lot of obstacles to go through in order to show his value in this business. He has proven perfect for this field because of his engineering and quality control skills, he pays very close attention to detail and has an eye for balance along with being artistic and is very friendly in customer service as well. Furthermore one of his greatest qualities is his ability to speak both English and Spanish which helps with our Spanish-speaking clientele. "This career allows me to challenge myself and then grow from them allowing the sky to be my limit which is so rewarding. I now spend more time with my wife and family and now I truly LOVE what I do. I enjoy LIFE and WORK, it's a great feeling to help change the lives of so many people!"